Preheat oven to 400°. Wash and drain grape tomatoes. Place on a baking tray. Drizzle with about 3 tbsp. of Garlic Festival Fire Roasted Garlic Olive Oil. Sprinkle with about 1/2 teaspoon salt and 1/8 teaspoon pepper. Take the garlic and cut the top off, making sure to expose every piece of garlic within the head. Wrap garlic with piece of foil. Drizzle 1 tbsp. Garlic Festival Fire Roasted Garlic Olive Oil on top and sprinkle with a generous pinch of salt and pepper. Wrap the garlic and place on the tray with the grape tomatoes. Place tomatoes and garlic in the oven for 20 minutes. After roasting, let cool. Cook spaghetti according to directions on package. When the spaghetti is al dente, reserve about 2 cups of the pasta water aside before draining it. Set pasta aside. Drizzle pasta with a little Garlic Festival Fire Roasted Garlic Olive Oil to keep from sticking. Take the roasted garlic and squeeze it on to a cutting board. Mash with a fork and set aside. Preheat a large sauté pan on the stove top. Add the remainder of your Garlic Festival Fire Roasted Garlic Olive Oil, about 1/4 cup, onto the pan. Add the tomatoes and garlic. Sauté for about two minutes. Add the pasta and about 1 cup of the pasta water. 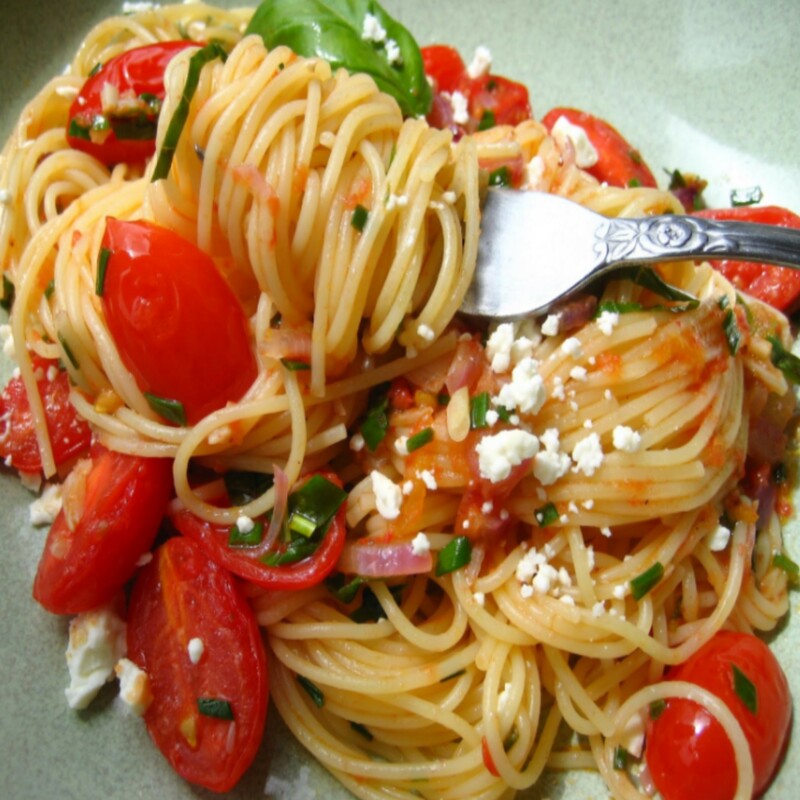 Toss pasta until garlic and tomatoes are fairly distributed throughout. Taste pasta and adjust with salt and pepper if needed. Take the basil leaves, finely chop and sprinkle on pasta. Drizzle Garlic Festival Foods Roasted Chili Olive Oil over pasta and toss once more. Take pasta and place it in a large bowl. Garnish with parmesan cheese.